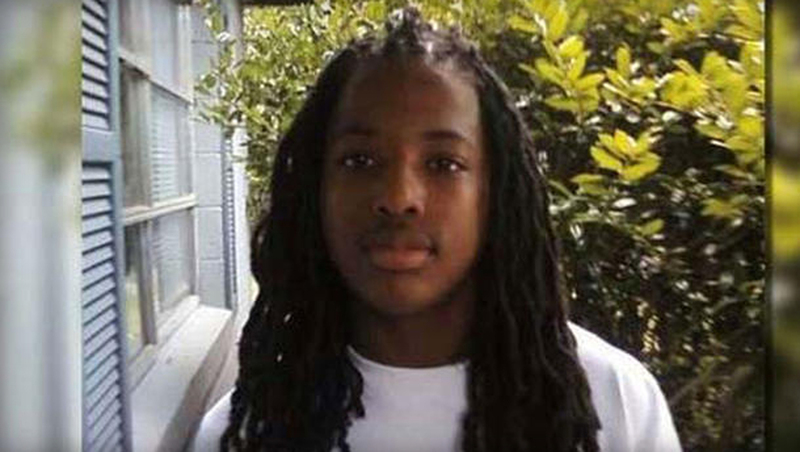 VALDOSTA, Ga. - Government agents this week executed search warrants at the home of two brothers accused in a civil suit of killing Kendrick Johnson, the Georgia teen found dead inside a rolled-up gym mat in his high school more than two years ago. A $100 million wrongful death suit filed by Johnson's family earlier this year alleges the brothers - who were schoolmates of Johnson - were encouraged by their FBI agent father to "violently assault" Johnson, leading to his death. No charges have been filed in the 17-year-old Johnson's January 10, 2013 death, however a federal investigation initiated in October 2013 by U.S. Attorney Michael Moore is ongoing. The Lowndes County Sheriff's Office - the initial investigative agency on the case - ruled the teen's death a freak accident, saying he fell head-first into an upright mat in the gymnasium at Lowndes High School in Valdosta while trying to retrieve a shoe, and became trapped. An autopsy conducted by the Georgia Bureau of Investigation agreed, citing asphyxiation as the cause of death. Johnson's family, however, insisted there was foul play involved and had their son's body exhumed for a second autopsy. It was then that a private pathologist concluded the teen died of blunt force trauma to the neck. Since then, Johnson's family and their attorneys have zeroed in on Brian and Branden Bell, ages 18 and 20, who are sons of FBI agent Rick Bell. Now, it seems government agents may be investigating the Johnsons' allegations. Paul Threlkeld, an attorney representing the Bell family, as well as the family of 18-year-old Taylor Eakin - Brian Bell's girlfriend - told 48 Hours' Crimesider on Thursday that warrants were executed early Tuesday morning at the Bell and Eakin homes, as well as Brian Bell's college dorm room. "Yesterday [Tuesday] at 3:30 am, the Bell family was awakened at their home by government agents, executing search warrants in a federal Grand Jury investigation about the death of Kendrick Johnson which is almost 2 years old - a case in which no one has been indicted and in which there is no evidence to implicate involvement of the Bells or any member of the Bell family. The case is built solely on suspicion, innuendo and rumor, not evidence," Threlkeld said in a statement. He added that the agents seized computers, cell phones and other property, including at least one work computer belonging to the Bell brothers' mother, Karen, limiting her ability to do her job. "The Bell and Eakin families will take every legal step available to protect their constitutional rights and their ability to work and pursue litigation necessary to restore their good names," Threlkeld said. 48 Hours' Crimesider has also learned that the U.S. Attorney's Office this week sought access to Lowndes County Sheriff's Office e-mails regarding the Kendrick Johnson investigation. "The Sheriff's Office and Lowndes County have fully cooperated and provided them with the requested information," Jim Elliott, who represents the sheriff's department as the attorney for Lowndes County, told Crimesider Thursday. The Lowndes County Sheriff's Department has stood by its finding that Johnson's death was accidental and maintains at least one of the Bell brothers - Branden - was not on campus when Johnson was last seen alive, and the other was in another part of the building. Johnson's family and their attorneys, however, contend both Bell brothers were on campus when Johnson was last seen alive. Furthermore, they say the brothers had motive to harm Johnson since one of the brothers - Brian - had previously been in a fight with him on a school bus about a year before Johnson's death. The Johnson family alleges local officials conspired to cover up the crime. The Bell family earlier this year filed a countersuit in response to the wrongful death lawsuit filed by the Johnson family. The countersuit alleges defamation and denies allegations the Bell brothers and their father were involved in Johnson's death in any way. A spokesperson for U.S. Attorney Michael Moore - who initiated the federal investigation into Johnson's death - declined to comment on the searches conducted this week, except to say the investigation is ongoing.